The Pistons have been a franchise since 1941 but didn’t have championship style play until the draft of Isaiah Thomas in 1981. During this time, Thomas along with Laimbeer, Johnson, Salley, Rodman and Dantley became known as the Bad Boys due to their aggressive, defense oriented style of competition. In 1989, the Bad Boys play paid off earning Detroit their first Pistons Championship Rings. The Pistons would also follow up the 1990 season with a two-peat earning them yet another NBA championship, but that would be the last for another 14 years. Following retirements (Laimbeer and Thomas, both by 1994) and multiple coaching changes, the Pistons would not return to championship caliber status until the 2003-2004 season which rounded off with the addition of Rasheed Wallace in February of 2004. Detroit went on to beat the Lakers in 5 games that year to win their third NBA championship. Replicas of the 2004 Pistons Championship Rings are selling on eBay with some cheaper examples available for less than $50. Some are comprised of CZ stones and some even come in a Cherry Wood box. The top of ring is a glamorized Pistons logo decked out in stones and says 2004 World Champions. One side has “Detroit Going To Work” written on it and it is followed up with Pistons 4, Lakers 1. It is an alloy material and it weighs approximately 137 grams. Other variations of the 2004 Pistons championship rings are being offered around the web. One of note is currently being offered for $30,000. It is 14kt Gold and filled with beautiful diamonds. The ring was made by Intergold and is the exact same rings the players received. It is also a replica of the owner’s, who was with the team for all 3 of their championship seasons. 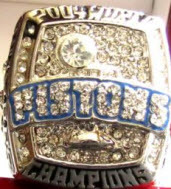 Original Detroit Pistons championship rings given to the players in 2004 actually have about 100 diamonds in them.